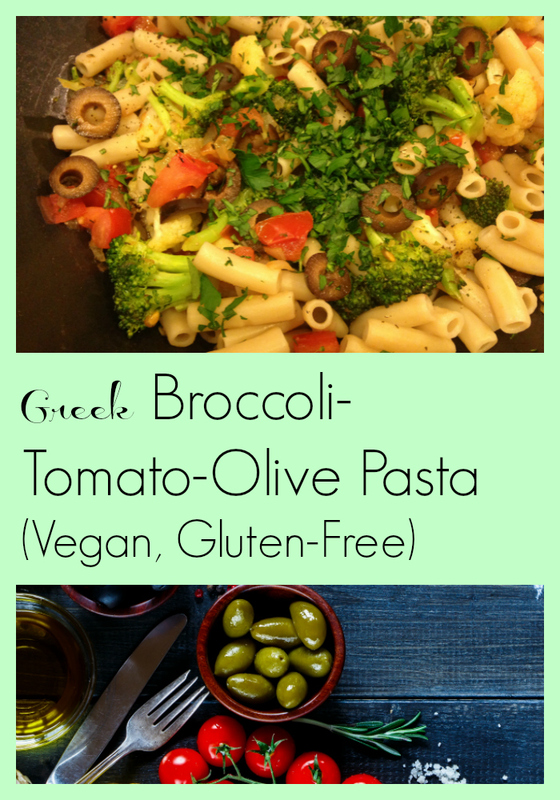 Broccoli, Tomatoes, and Olives with fresh herbs - yum! This is one of my favorite go-to easy dinners when I don't have much inspiration or time to cook. It's vegan, gluten-free, sugar-free, and loaded with veggies and herbs. It goes together in about 30 minutes, and is satisfying and delicious. I invented this recipe one night when I had a huge bag of broccoli from Costco and needed inspiration for what to do with it, and I've made it regularly ever since. Cook pasta according to package directions. While it's cooking, sauté the onions and garlic in olive oil for 5-7 minutes, until translucent (and beginning to brown on the edges if desired.) Toss in the fresh thyme sprigs (I often just use the whole sprig, then pick it out later, but you can de-stem it and chop the little leaves if you have time) and the dried oregano. Sauté for a minute or two, then add the broccoli and red pepper flakes. Sauté the broccoli, stirring to coat it with the spices and flavors, then lid the pan for 3 minutes to steam it a bit. If it seems too dry, you can add a tiny bit of water to keep it from sticking. Uncover and add the chopped tomato and olives. Sauté until the tomatoes begin to break down and become a little saucy. Salt and pepper to taste, and then toss with the pasta, top with the fresh herbs, and serve.